I was cycling into Hastings, my home town, and I saw this fishing boat coming along the coast with me. I arrived at the harbour before the boat. I had my painting gear, but decided that trying to get this fast moving scene down would be too much, so instead I took some pictures, as they hauled the boat up the beach with the winch. 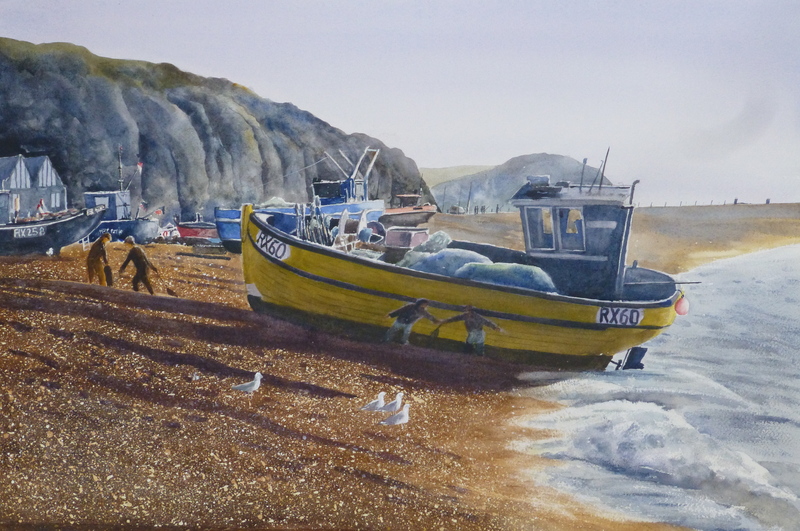 I then walked over to the other side of the beach and painted some fishermen setting up their boat and nets. At least they stayed almost in one spot for the duration. It was a lovely morning and I cycled back to where my dad now lives feeling I had done a bit and it still wasn’t ten o’clock.